Growth first have worked with Aston Business Assessments (a spin out company from Aston University) to develop a psychometric tool specifically for assessing personality and core competencies for sales and customer service. 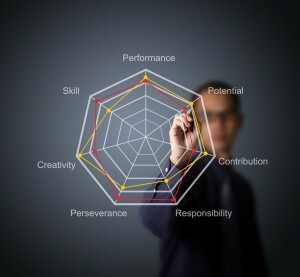 In developing the tool we have mapped out the 13 key personality traits that can help understand your teams natural preferences and patterns of behavior. This will help you understand their strengths but also anticipate any weaknesses or development needs. Sociability, leadership, compassion, cooperation, sensitivity, optimism, achievements, orderliness, industrious, stability, calmness, culture and intellect. Active Listening, Solution Selling, presentation skills, organisation and planning, handling objections, effective questioning, drive for the sale and customer focus. Psychometric testing provides a powerful way of ensuring the best candidates are selected by assessing their ability and preferred behavioural styles. Just some of the key benefits of psychometric testing are detailed below. More efficient and effective candidate selection and retention. Provides additional information to support other candidate selection techniques and reliance on CV interpretation. Increases the efficiency of interviews by highlighting areas to probe. Assess likely behaviour at work and how this may impact performance. Provides insight into team profiles and how individuals may fit in.